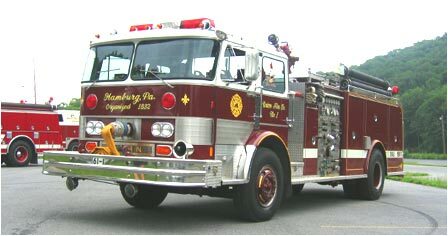 Engine 61-1 is a 1980 Hahn custom pumper. The unit is equipped with a 1250 gpm pump and a 700-gallon tank. The engine carries 400 feet of booster hose, 700 feet of 1½” hose, 600 feet of 2½” hose and 1000 feet of 5” hose. The engine carries a variety of hand tools, 48 feet of ground ladders, a “Pro-pack” foam system, and 25 gallons of Universal Gold foam. The engine is also equipped with a generator and complete scene lighting package. This unit received a complete rebuild in 1997. This is now a Reserve Engine.